Boxer Building provides quality decking installation throughout Essex and surrounding counties. The excavation and sub-base’s are the most important factors in building a Driveway. If the excavation / Sub-base is too shallow then whilst drive may visually look good, it will only last for a short period of time. 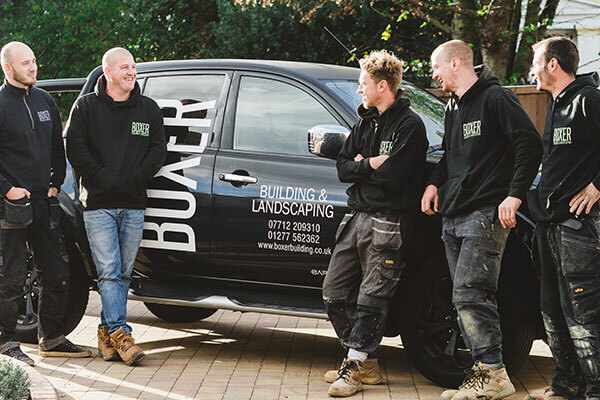 At Boxer Building and Landscaping we don’t use cheaper alternatives in our sub-base’s such as road plainings or recycled materials. Our bases are heavily compacted and on the larger driveways, we roll the bases with a 3-ton roller to ensure there aren’t any weak areas. All of our deckings are built using quality wood or composite. We will meet you to discuss your plans and advise of any issues that may arise and the best way to work around them or support them. We are proud to have a 5 star rating with Trust a Trader, Rated People and Yell. We’ll meet at your property to discuss your design requirements, budget, and materials. We’ll listen to your ideas and then use our professional experience to see how we can enhance your ideas, whilst remaining within budget. Once we have an idea what you are looking for and your budget, we’ll start with a quotation and design. From here we’ll set up a second meeting to discuss the quotation and design, and make any amendments. A full specification will be written up to state the design, materials used, potential start and completion dates. During the development stage, the client is kept unto date with how the project is running and the estimated completion date. Your property is always treated with care to ensure no damages are made. In the unlikely event that any damages are caused Boxer Building & Landscaping are fully insured. On completion of the project, we will take a walk through the job to answer any questions. Boxer Building & Landscaping will not finish until you are 100% happy with the outcome. Your content goes here. Edit or remove this text inline or in the module Content settings. You can also style every aspect of this content. To ensure we provide a quality service and advise only where we feel will benefit your project. To respect your living area and be able to answer any questions you may have throughout.